Want to witness the lovely art of leather tanning and leather fashion history? 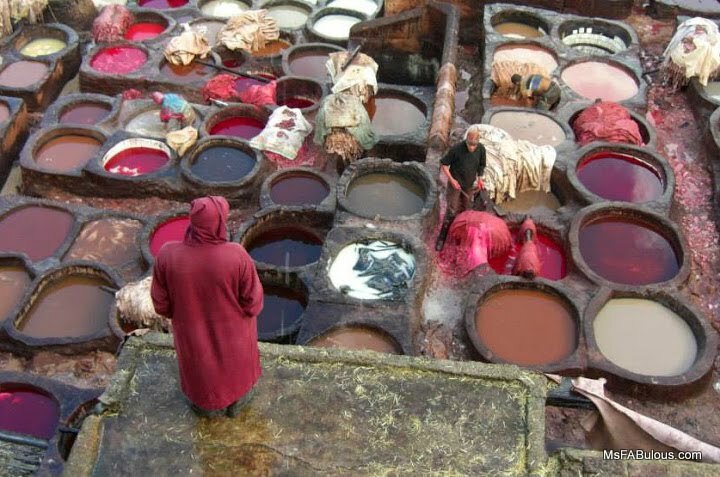 If you ever travel to Morocco, make sure a trip to Chouara Tannery in Fes is on your agenda. Leather tanning in Fes is an amazing site to behold. There, you will see raw animal skins drying and being dyed in a giant city square in clay vessels. You will see the richest of pigments and workers sweating it out with a process that has not changed since the 12th century. It doesn't smell pretty. A key ingredient in the dying process is pigeon poop that softens the leather, while limestone helps singe the fur off. What do you visit the tannery will determine what colors you see in the vats. As intense as the colors, the dyes are made from natural sources. Red pigments come from poppy flowers, blues from indigo, yellows are made from expensive saffron petals. The end products are found in the labyrinth of medina stalls around you. If you ever dreamed of losing yourself shopping Fes is the place to do it. 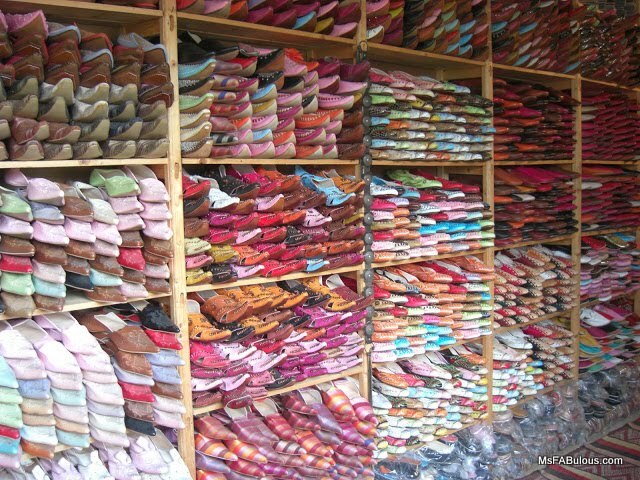 You will find endless choices of handbags and slippers made locally. The silhouettes and intensely vivid colors are gorgeous. The slippers are perfect for Boho street style selfies. Hell, every angle of this city Instagram-worthy. Negotiating a fair price for your fashion haul might seem intimidating. I have shopped markets around the world and find the (mostly) men here more easy going than other countries for a touristy area. In my experience, the men here will start a little high, but they are quick to let you know what price is acceptable quickly rather than do the dance for hours. When the deal and purchase is made, they always ask if you are happy. They don't like for you to leave with bad vibes (but to be clear, they will let you leave with your money in their pockets if need be).